During the mid-nineteenth century, a movement was taking place in the United States and Western Europe recognizing the plight of the poor, indigent, and mentally unstable citizens. In the United States, many counties established what were often referred to as poor houses, poor farms, infirmaries, and asylums. 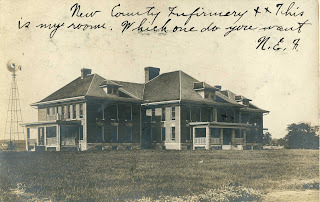 Generally, individuals suffering from mental illness were also housed at these county-established residences, though most states also erected state mental institutions to house those citizens of the state that were deemed to be more problematic for the counties to handle and maintain in an adequate state of care. Prior to 1855, Porter County's indigent were placed in the care and oversight of responsible individuals who were compensated $1 to $2 a week per person. Overseers of the Poor in each township of the county were given the authority to appoint such caretakers, and it has been stated that "There was not a township that did not have, in its time, some pauper in the care of its citizens." Porter County also contracted with local physicians so that all paupers received appropriate medical care and treatments. Eventually, county officials decided to consolidate care since it was becoming increasingly difficult to manage the situation when the poor and their caregivers were scattered widely across the county. William C. Pennock rented out his farm south of Valparaiso to the county to establish the Poor Farm of the Board. The contract between Pennock and the county stipulated that Pennock would retain two-thirds of all agricultural production on the farm, while the county would retain one-third. Pennock would also be compensated $1.50 per week to board each county pauper, exclusive of medical expenses. The rental of Pennock's property soon evolved into a purchase. 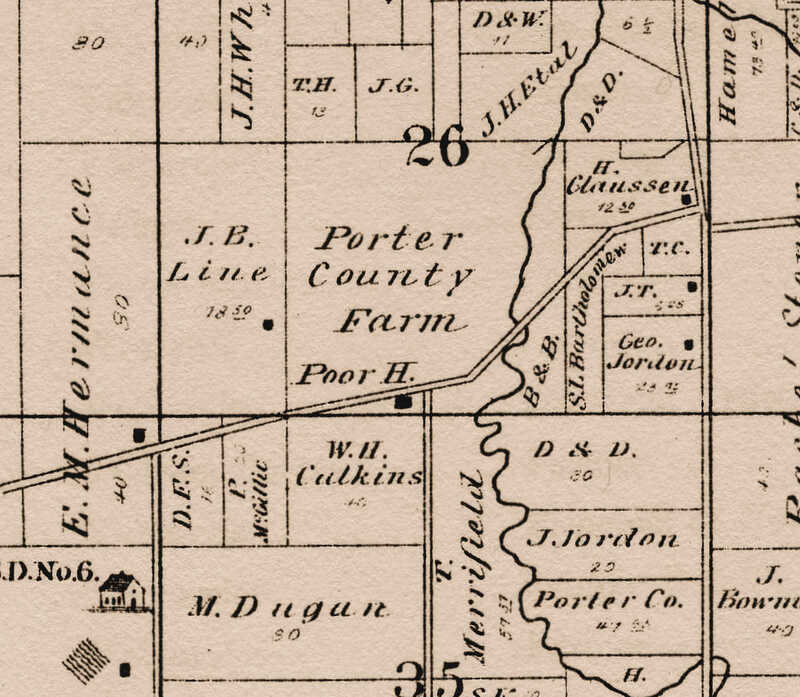 On June 7, 1855, Porter County Commissioners approved the purchase of 80 acres from Pennock for the sum of $3,000. This land comprised the east one-half of the southwest quarter of Section 26 in Center Township. Pennock was also appointed the first superintendent of the Porter County Poor Farm, accommodating individuals in the home already being used to care for the poor on the newly purchased property. On September 1, 1856, a new dwelling constructed by George C. Buel was opened on the poor farm property to house the poor. This structure had a footprint of 32 feet by 45 feet and cost the county $2,482, being paid with a combination of cash and county-issued bond revenue. Residents were, for the most part, self-sufficient. Shelter and meals were provided to the residents in exchange for labor in farming and upkeep of the property. 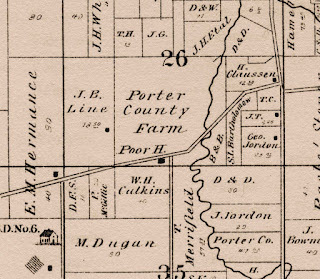 An adjacent 80 acres directly east of the Porter County Poor Farm was purchased by the county for $3,200 in March 1866 to expand the farm to 160 acres. The farm was expanded again on June 16, 1875, when the county purchased all that part of the northeast quarter of Section 35 in Center Township which was lying north and east of Salt Creek and south of a line drawn parallel with the north line of the quarter for $1,200 from W. C. Hannah. On June 9, 1876, yet another purchase took place to expand the farm when the county purchased southeast quarter of the southwest quarter of Section 27 in Center Township for $1,200. 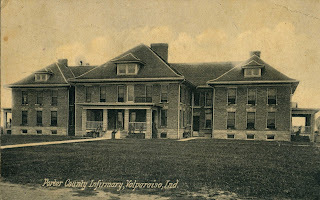 Postcard view of the Porter County Poor Farm, circa 1910. The third and final home to be located on the Porter County Poor Farm was a substantial brick structure. Designed by local architect Charles F. Lembke, ground was broken for this $25,000 building soon after the sale of county-issued bonds on August 7, 1905; construction was completed in 1906. Shortly after this building was completed, a barn was erected on the property at a cost of $4,000. 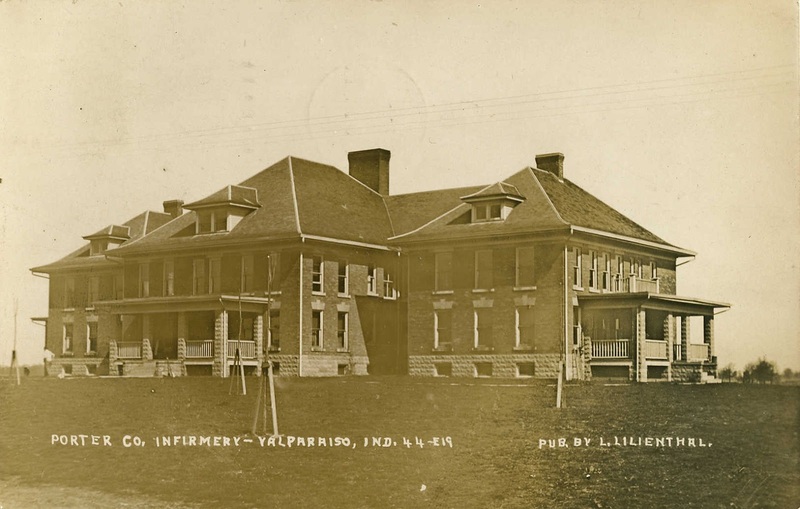 At some point in time before the construction of the imposing brick building, the Porter County Poor Farm was being more often referred to as the Porter County Asylum. This suggests that the county was transitioning from housing the poor and indigent to include individuals with real and perceived mental deficiencies and what were considered, at that time, socially undesirable characteristics. There had always been some disagreement as to the official name of Porter County's facility, but that was to be corrected when Indiana passed legislation in 1947 that required every county in the state to refer to their respective facility for the indignant as their "County Home," each county's name preceding the words County Home. The confusion over the name of Porter County's facility is illustrated in the plat maps below. The three plat maps, spanning 112 years, each refer to the Porter County Home with a different name. 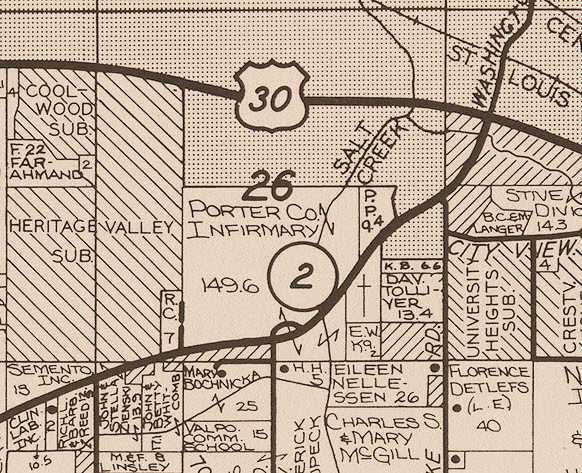 The last map shown, published in 1988, refers to the facility as the Porter County Infirmary, which is obviously inconsistent with the 1947 law. 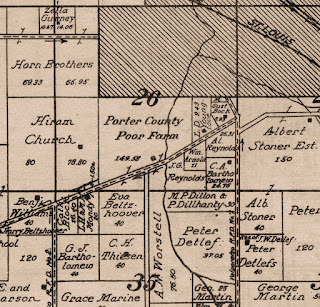 Plat map showing the Porter County Farm and Poor House in Section 26 of Center Township, 1876. Source: A. G. Hardesty's 1876 Illustrated Atlas of Porter County, Indiana. 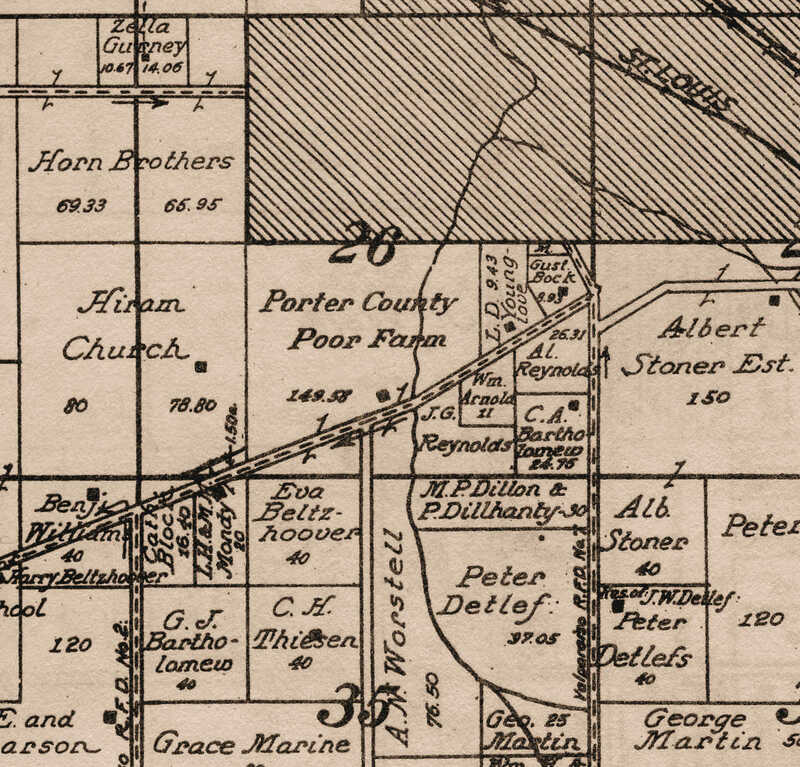 Plat map showing the Porter County Poor Farm in Section 26 of Center Township, 1921. Source: George A. Ogle and Company's 1921 Standard Atlas of Porter County, Indiana. 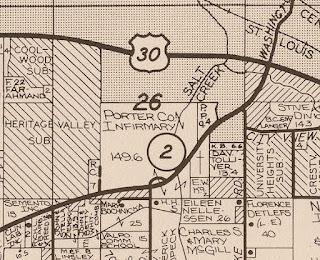 Plat map showing the Porter County Infirmary in Section 26 of Center Township, 1988. Source: Town and Country, Inc.'s 1988 Porter County, Indiana: Official Plat Book. As reported in early Twentieth Century county newspapers, the institutionalized included the truly insane, sociopaths, psychopaths, and the delusional, as well as the poor and indigent, unemployed (bums and hobos), epileptics, adulterers, prostitutes and loose women, homosexuals, alcoholics, and drug addicts. 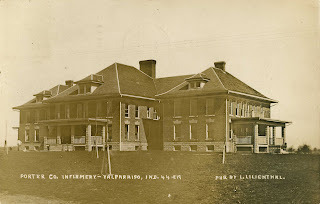 Oftentimes, the Porter County Asylum served as a temporary housing solution before an individual was committed to the Porter County Jail, Indiana State Prison, or one of the state-operated mental institutions. When the Social Security Act of 1935 and subsequent welfare-related legislation was passed, the demand for the Porter County Home diminished considerably, though residents were still residing at the home as late as 2002 when the facility was permanently closed due to funding issues. Not a single individual in the above list has a known marked burial. Albert Eastland, a well known character of Valparaiso died at the poor farm last Saturday. Albert was called an idiot, though at all times he was able and willing to work. He was harmless, faithful and honest. During centennial exhibition at Philadelphia, the people of Valparaiso had raised a purse and sent him to that place, where he attracted a great deal of attention. He was gifted with a tongue of abnormal size, and perhaps larger than that of any living man. When he wanted to prove his identity he would simply stick out his tongue, which would reach way below his chin. He was given a big funeral, and the funeral sermon, preached by Rev. Smith pastor of the M. E. church, is said to have been one of the best and most touching ever delivered in this town. Mrs. Ells, of Wheeler, one of the well-known Kersey family of Twenty-Mile Prairie, could not believe the statement of the death of Edward Kersey at the poor house recently could be correct, because she thought no person of that name had lived so long in Porter county. We accordingly inquired of Mr. Hesser, superintendent of the poor-asylum, and he gives assurance that our statement is correct both as to name and twenty years residence, yet he was a man whose name was not so public as to come to Mrs. Ells' notice. We are told a brother of the deceased man lives here now. On November 11, 2005, the Porter County Home was heavily damaged by an arsonist using kerosene as an accelerant. The extent of the damage was so severe that it was decided to raze the building, which took place during late February and early March of 2006. Nobody was ever arrested and charged with this arson event. Thus ended the life of Porter County's facility for the indignant, a life that spanned slightly more than 150 years. Hassett, Kayla. 2013. The County Home in Indiana: A Forgotten Response to Poverty and Disability. M.S. Thesis. Muncie, Indiana: Ball State University. 346 p.
Shults-Gay, Deborah H. 1923. One of the Earliest Authentic Histories of Porter County, Indiana: From 1832 to 1876. Publication location not provided: Deborah H. Shults-Gay. Unpaginated. Porter County Vidette, Valparaiso, Porter County, Indiana; March 9, 1882; Volume 26, Number 10, Page 5, Column 1. Porter County Vidette, Valparaiso, Porter County, Indiana; September 28, 1882; Volume 26, Number 39, Page 5, Column 4. The Tribune, Chesterton, Porter County, Indiana; May 10, 1888; Volume 5, Number 4, Page 1, Column 7. The Tribune, Chesterton, Porter County, Indiana; November 27, 1891; Volume 8, Number 33, Page 8, Column 5. The Tribune, Chesterton, Porter County, Indiana; October 7, 1892; Volume 9, Number 26, Page 5, Column 4. The Westchester Tribune, Chesterton, Porter County, Indiana; November 13, 1897; Volume 14, Number 31, Page 8, Column 1. The Chesterton Tribune, Chesterton, Porter County, Indiana; May 14, 1898; Volume 15, Number 5, Page 1, Column 1. The Chesterton Tribune, Chesterton, Porter County, Indiana; November 5, 1898; Volume 15, Number 30, Page 1, Column 6. The Chesterton Tribune, Chesterton, Porter County, Indiana; December 10, 1898; Volume 15, Number 35, Page 4, Column 3. The Vidette-Messenger, Valparaiso, Porter County, Indiana; March 30, 1929; Volume 2, Page 1, Column 1 and Page 3, Column 7. Column titled "Grand Jury Scores Poor Farm, Jail. Conditions of Buildings at Both Institutions Come in for Condemnation Because of Inadequacies." The Vidette-Messenger, Valparaiso, Porter County, Indiana; November 8, 1930; Volume 4, Page 1, Column 2-3. Column titled "County Council Head Lodges Protest Against Farm Bureau Activities Poor Farm Chief." The Vidette-Messenger, Valparaiso, Porter County, Indiana; June 19, 1936; Volume 9, Page 1, Column 6 and Page 2, Column 5. Column titled "Head of Poor Farm Victim Fall Mishap." The Vidette-Messenger, Valparaiso, Porter County, Indiana; April 8, 1947; Volume 20, Number 234, Page 1, Columns 2-3. Column titled "State Law Makes It 'The Porter County Home' Now." The Vidette-Messenger, Valparaiso, Porter County, Indiana; July 25, 1949; Volume 23, Number 18, Page 4, Columns 1-8. Column titled "Porter County Home Plans Open House." The Times, Muster, Lake County, Indiana; November 14, 2005. Column titled "Fires at Porter County Home Ruled Arson." The Times, Muster, Lake County, Indiana; November 15, 2005. Column titled "Arson Destroys County Home. Porter County: Public Asked to Call Police with Any Information on Friday Blaze" by Matthew Van Dusen. The Times, Muster, Lake County, Indiana; November 17, 2005. Column titled "Reward Offered in County Home Fire. Arson at County Building is Crime of the Week" by Ken Kosky. The Times, Muster, Lake County, Indiana; January 8, 2006. Column titled "Some Still Smoldering Over Arsonist's Work. County Home Blaze Remains Mystery, Tragedy to Former Tenants" by Matthew Van Dusen. The Times, Muster, Lake County, Indiana; April 5, 2006. Column titled "Unbuilding the Porter County Home. 101-Year-Old Building Torn Apart but Bricks, Timber and Materials Salvaged" by Matthew Van Dusen. Haniford, Jim. 2006. That Which Doesn't Kill Them...A Ghastly Historical & Supernatural Account of the Porter County Home. Paranormal Society of Indiana. Website: http://www.freewebs.com/paranormalsocietyofindiana/portercountyhometribute.htm [Accessed September 2016].